Tuesday January 9th 1900 It was a rainy day. I did not have extra house-work on hand and did a lot of sewing Wednesday January 10th 1900 I did a small washing alone and other work. not a bad winter day. Ada McCallister was here all afternoon Charlie Williams here all the evening. 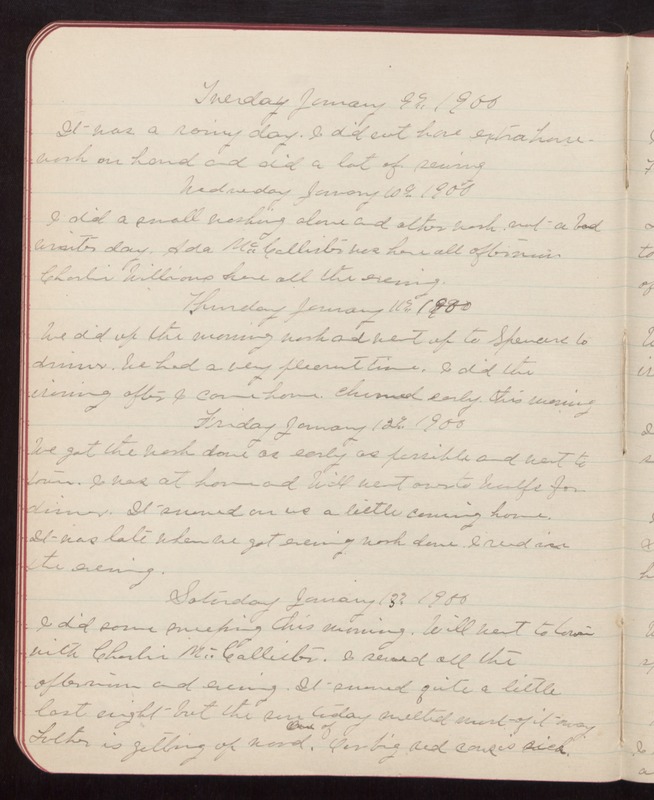 Thursday January 11th 1900 We did up the morning work and went up to Spencers to dinner. We had a very pleasant time. I did the ironing after I came home. Churned early this morning Friday January 12th 1900 We got the work done as early as possible and went to town. I was at home and Will went over to Woolfs for dinner. It snowed on us a little coming home. It was late when we got evening work done. I read in the evening. Saturday January 13th 1900 I did some sweeping this morning. Will went to town with Charlie McCallister. I sewed all the afternoon and evening. It snowed quite a little last night but the sun today melted most of it away Luther is getting up wood. One of Our big red cows is sick.